Recently, one of my colleagues, an Economics Lecturer, Indrajit Aponso, was explaining to me “how disciplined drivers lose against reckless drivers”. It is customary that “road indiscipline” has become a hot topic so that everyday many including all types of media have something to say about it. I remembered speaking on the same subject to another friend, Dr. Nirmal Ranjith who happened to tell me about his observations. Motorists are confused because a rule is enforced one particular day and, then it’s kept aside for many months being tolerated and even encouraging its breach of conduct. When the authorities fail to enforce road rules particularly in a systematic and consistent manner, the motorists who follow the road rules fall back while those who don’t follow them proceed forward. This is a simple example to illustrate “how the upright lose and, the wicked win”, when the law enforcement is deteriorates. This principle is valid for application to your day-to-day life issues as well as to big national issues. Although the sale of tobacco was banned a few months ago, a grocery shop near our neighbourhood continued to have its tobacco leaf business as usual. After seeing this, one day I asked the business owner: “Isn’t the sale of tobacco banned now?” With a sarcastic smile on the face, he replied: “Talk only.” I realised that one of the biggest national problems of this country was embodied in these words: Lack of the rule of law. Let me explain the economic implications of the lack of law enforcement. There have been many rules and regulations passed or proposed by the government in the past. But on many occasions, the public has later observed the government’s wavering attitude towards enforcing them. As a result, public opinion and reaction to such initiatives are also uncertain. I take the most recent “polythene ban” which became effective just a few days ago, only as an example to illustrate my economic tutorial; otherwise, according to the reports it is going to be strictly enforced. In a bid to make Sri Lanka a polythene-free land and to find a sustainable solution to solid waste management, the government banned the production, the importation and, the use of polythene with effect from September 1, last year. But later, allowing for a period of adjustment the effective date of polythene ban was extended by four months to January 1, 2018. The first type was the preparation by some of the firms and businesses to use environmentally-friendly, alternative packing materials. The second type was the other group of firms and businesses which showed absolutely no response to the government notification. The first group might have thought that the polythene ban would be implemented so that they would be prepared for the change. The second group did not anticipate the enforcement of the polythene ban so they continued with “business as usual” not taking the government announcement seriously. What a contrasting and contradictory response to the authorities! According to the theory of rational expectations, public responses to government policies vary how they process information from past experience. Therefore, the response by the second group was not surprising, as they perceive that law enforcement is just “talk only”. Let us take a moment to understand economic implications of the above problem when these two types of businesses are operating in the same market. Firm A represents the first type of companies. These firms initiated policy measures to switch into environment-friendly packing materials. This preparation incurs additional costs to the firm, but it does not matter when it is applicable to everyone. Firm B represents the second type of companies. They did not bother about the government notification and, continued with the same as business as usual. This is risky if the polythene ban is enforced. The difference between Firm A and Firm B is the cost and risk of compliance to the law enforcement. Compliance is costly and, non-compliance is risky, but it all depends on how effective would be the law enforcement. 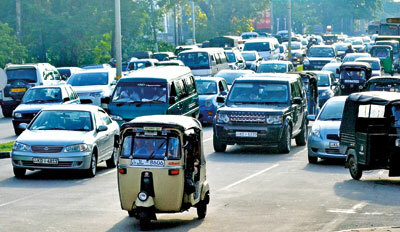 File picture of traffic in Colombo. Note the the way the tuk-tuk is parked (extreme right) blocking traffic. For the analysis, let us assume that initially both Firm A and Firm B have the same cost structures and are equally competitive in the market. Being competitors, they both are “price takers”; the price is determined in the market, while they individually do not have price-making power. They both are producing an identical commodity, using polythene as the packing material. Each firm is supplying, for example, 500 million units to the market. Therefore the market supply is the sum of both firms’ production, which would be 1000 million units, sold at Rs. 100 each. If the law is not enforced, what would be the market adjustment? What would be the implications on businesses? Firm A, after spending on all above activities, started getting ready to introduce an environmentally-friendly alternative packing material by the effective date of the polythene ban. Because this adjustment is costly, the new cost structure of Firm A becomes higher than before. Firm B, on the other hand, finds even a lower cost structure than before, because polythene supply is now cheaper than before due to the fall in its demand. When law enforcement is weak, Firm A becomes a “high-cost” producer and, Firm B a “low-cost” producer. Given the profit-maximising economic principles, Firm A faces a fall in its output sales and, hence its market share. In contrast, Firm B increases its output and market share. Given the market price of Rs. 100 per unit of the product, now Firm A makes short term losses as it has to sell the product at Rs. 10 less than unit cost. Firm B makes short-term uncompetitive profit as it can sell it at Rs. 10 more than its unit cost. While there might be different scenarios about the long-term market adjustment, one of the most common outcomes would be that the loss-making firms which comply with the polythene ban will leave the market. They can even reverse their intended compliance to the law, if they wish to remain in the market. Perhaps, the market power of Firm B could even increase as the market moves away from competition. Another possibility would be the market differentiation, provided that there would be customers concerned with environmental implications of the packing materials who will be willing to pay a higher price for Firm A products. In this case too, however, Firm B continues to remain in an advantageous position due to its low cost structure. More importantly, the wavering of law enforcement adversely affects the business environment. As there are risks and uncertainties in the market, new investors find it difficult to execute their business plans; they do not know which is right and which is wrong! Isn’t this an important reason to suggest why the business environment in Sri Lanka is not attractive to investors?